Contains ultra high antioxidant level of 12.9% vs 5-6% for mass-market teas. Character: Good body, full flavored, tending herbaceous with satisfying sweetness. This tea has very well developed long leaves, with a hint of silver tip signifying that the plucking is extremely selective. 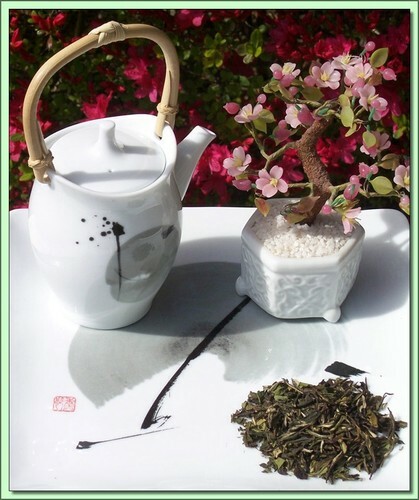 (In order to get the ‘tippy’ leaf style the tea must be plucked daily so only the new shoots are gathered). This tea is primarily harvested/plucked during the early spring when the tea bushes first begin to flush (can be compared to 1st flush teas). This tea comes from the mountainous region on the Wuyi Mountains. Although it is a green tea, it is allowed to ferment very briefly to give the dry leaves a dark hue. The taste is much smoother that traditional green teas with body and some pungency. The aroma is almost sweet and floral. A good tea for someone who is traditionally a black tea drinker but would like to try a green tea without giving up too much strength and body. Hot Tea: This tea is best enjoyed by pouring 212F/100C (boiling) water over the leaves (1 teaspoon per cup) for 2-5 minutes (longer=stronger). Don't remove the leaves. Can be infused repeatedly 2-3 times using higher temperatures & shorter infusions until flavor is exhausted.